Hello Fall!!!! I love you so much. I love the colors of fall, the crisp air and the holiday seasons that are coming along from Halloween to Christmas, how fun. Today if you came by my blog to see my project I am so blessed and if you came by to do the hop with Jess from KinderStampo, thank you and I hope you add me as your friend and come back often, you should have arrived from Madison's Funky Cards Blog if you are hopping in the right direction but remember you can always start at the beginning by going to KinderStampo Blog. We challenged to make albums using pockets and I am always up for a challenge (thanks Jess). I used 5 pages from the Melissa Frances book with pockets. It is really a 10 page book but I only used 5. I used the Recollections Autumn Collection that I bought last year at Michael's on the clearance rack for 80% off, you can't beat that. See how the tags come out of the pocket holders. I tried to make each one interactive and even added a few extra hidden compartments. Like this one, on one sheet of the paper was the Thanksgiving Dinner menu, of course it was a must to add but because my pockets were only a little over 4" wide I had to fold it in thirds and used this fun clip to hold it together. See how it is when it is folded out. I can add our Thanksgiving menu to it when the time is right and maybe even a few of our favorite family recipes. Some of our Family Traditions is having a house full of family and friends come for the day but usually it is like a 4 to 5 day celebration. I thought I would have a page with some our favorite things we do like games, going to the park, etc along with a list of everyone's names and address - just so it would be more of a keepsake book then anything else. One of our Family Traditions is we always go around our tables (because we have so many guest we have multiple tables) and tell what we are most thankful for. I am planning to have them right their thanksgivings in my book this year. Isn't that an awesome idea. All of the tabs have some kind of three dimensional decoration on them, I like this one the best and use it all of the time. Another thing my husband and I have done now for the last 15 years is give our children, grandchildren and friends a special ornament at Thanksgiving. We try to buy an ornament that commemorates an event that they did that year, we also try to find one that would be a first that they ever did so it would mean more. For instant we have two of grandchildren that just started karate so that might be a possibility for their special ornament this year. Of course I will have to now document them this year in my cool little pocket album that I made. Here is the front side of my pocket inserts. And here are the back of my pocket inserts. I hope you enjoyed my "Family Traditions" Pocket Album and that you are inspired to try to make one for you and your family. 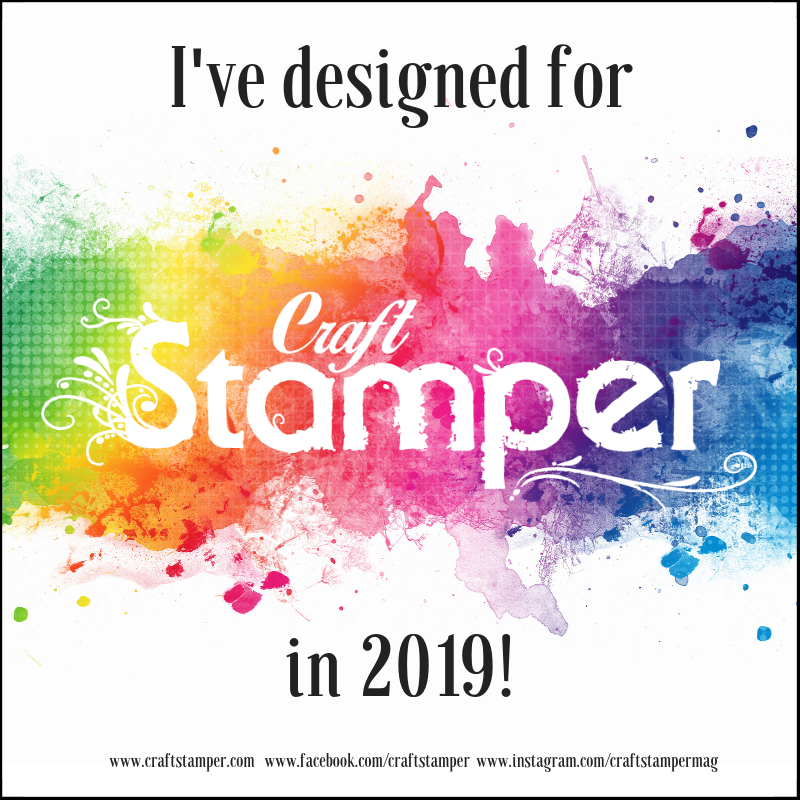 I hope you continue on the hop by going to Sandra's 365 Days of Cricut and see her fabulous Pocket Album, she is so talented and I am sure you will be inspired by her also. Remember to start the hop with KinderStampo there will be lots of inspiration, tutorials and giveaways along the way. 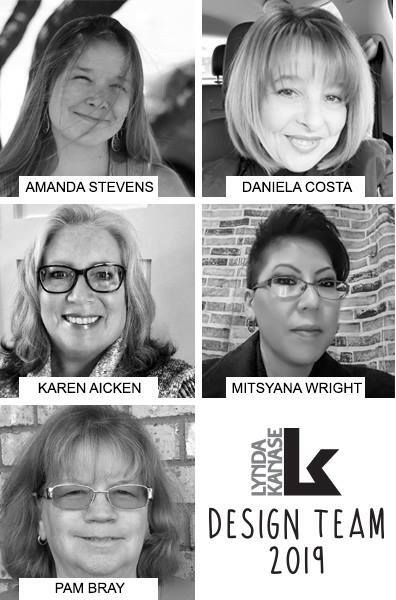 I know that KinderStampo has 4 sponsors: PSA Essentials, PYMII, Helmar, and Lindy's Stamp Gang and you wouldn't want to miss out on that. 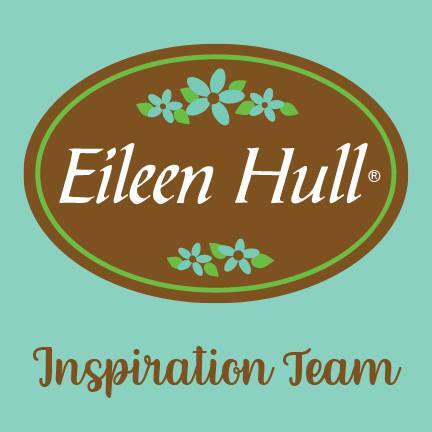 Again, I would love for you to leave a comment and follow my blog if you are inspired to do so. To start score your 12" x 12" double sided paper at the 4" and 8" score lines on your ScorPal or other scoreboard. Turn the paper and score again on the 4" and 8" score lines so that you form intersections. On each corner score diagonally to the corner of the center square. Fold sides up and corners in when finished so they will form your candy dish. Open the paper back up and lay where the inside is facing up. Here are the 4 different sides to my box. 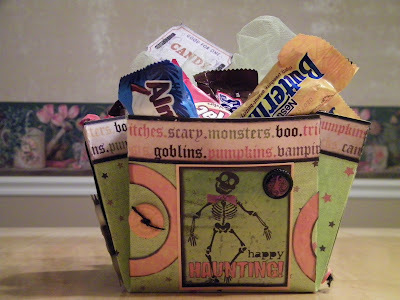 I just decorated the outside of my box with Bo Bunny Spooktastic stickers, buttons that I had colored in, black twin, pop dots, some brads and fussy cut some of the scraps from the My Minds Eye papers I used. 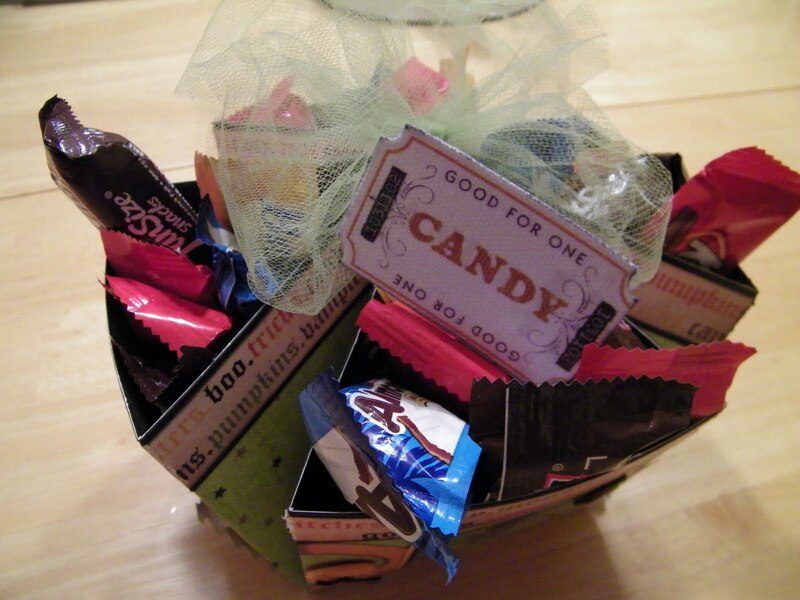 This is a wonderful way to use your scraps and stickers up that you have in your stash and make a wonderful candy box. I hope you enjoyed all of the detail on my box and will try making one for yourself. It is so super easy using your ScorePal and will make a wonderful table arrangement or gift. Jennifer from the Crafty Card Gallery has made her first sketch challenge blog hop. 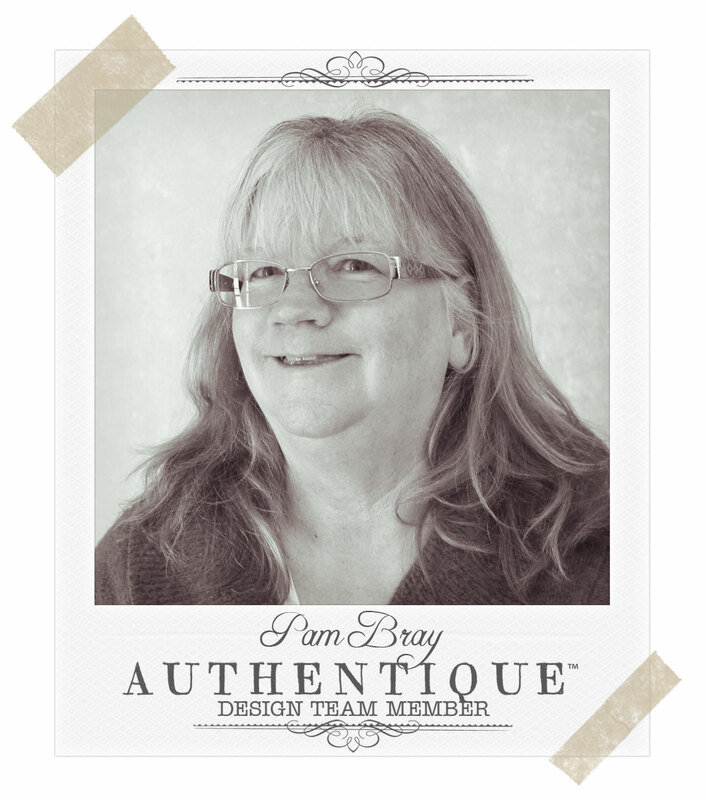 I hope you give a big shout out to Jennifer on her first card sketch so she will want to continue doing them. 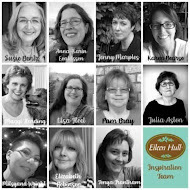 If you have come from Lynda's Memories in Thyme Blog then you are heading in the right direction but if you just popped in to see what was going on today with Scrapbook Flair I would invite you to pop over at the Crafty Card Gallery and join us in the hop. 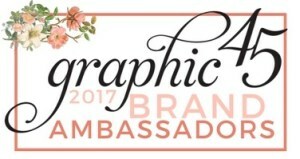 I am sure you will see lots of fabulous ideas, tutorials and maybe even see some blog candy you might want to win. We were ask to make either a school card or a fall card using the card sketch. Here is my card that ask your child's teacher to call you. I hope you enjoy and continue the hopby going to Susana's Scrappin' Corner. 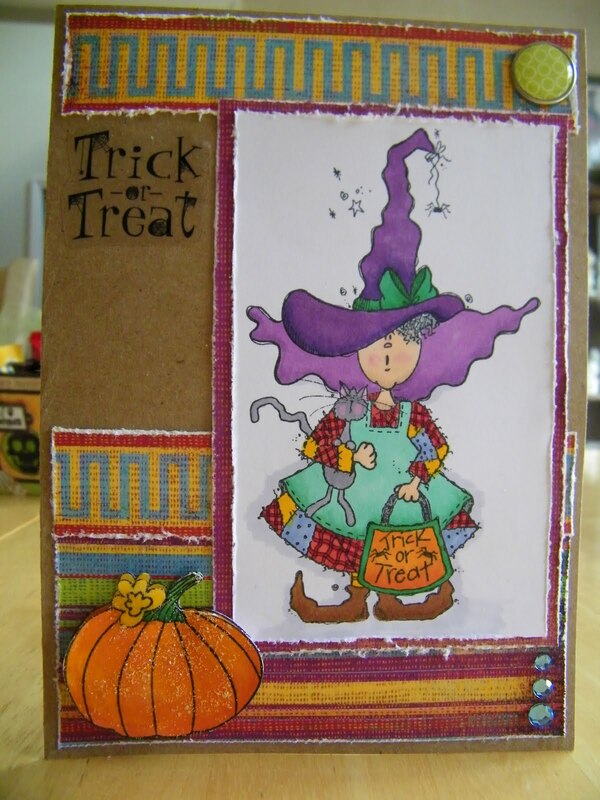 Please pop back in tomorrow because I will be doing a fall card using my interpretation of the card sketch. Thank you Jennifer for sharing your sketch with us. 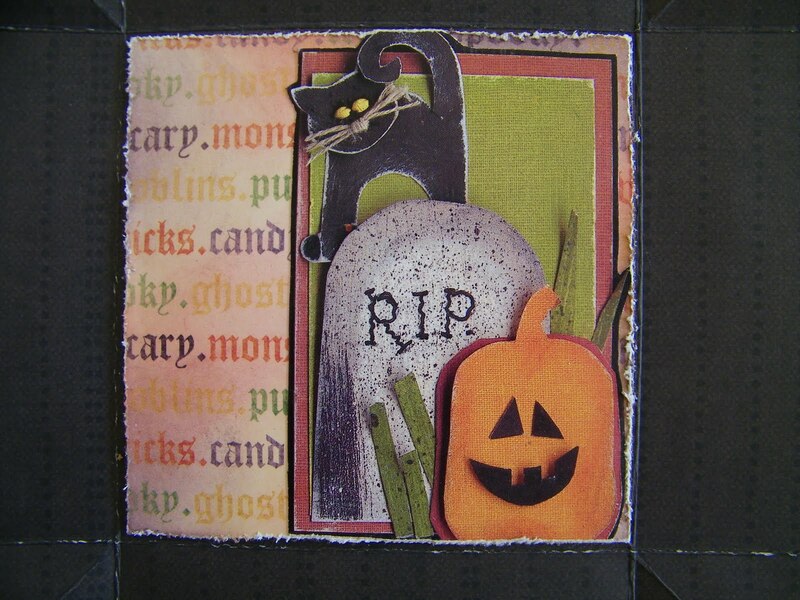 Todays Halloween Card is my "Boo"Card that I made using the My Minds Eye Nightfall Accessory Sheet, Spooked Stripes and Spooked Words papers. 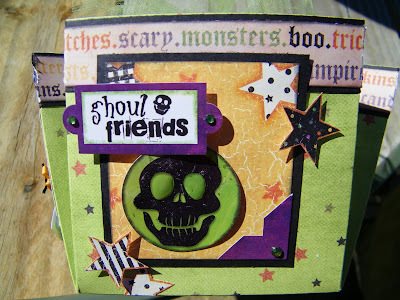 I took all of the pieces using my Tim Holtz Distress Tool and the Wild Hone and Dusty Concord Distress Inks I distressed all of the edges of my cards. I then added my border strips to the front of the card that I had assembled on my card base. 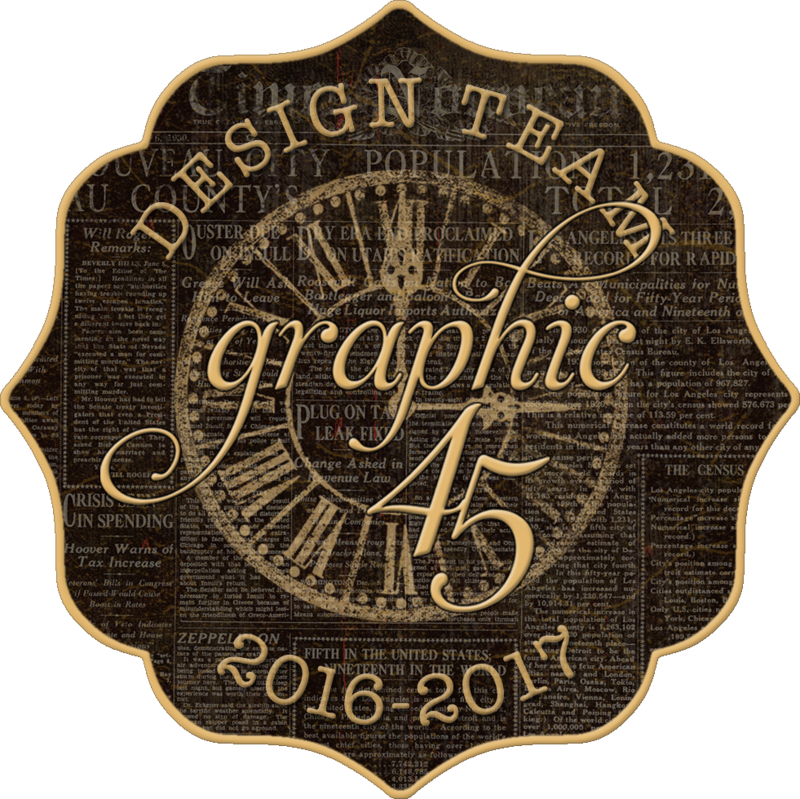 I added my tag by placing it on pop dots, added a button that I had tied with sheer green ribbon and added a sticker from the Paper Studio Stickabilities. When it was together I added Flower Soft Sage Green to the leaves. If you have never used Flower Soft you will love it but remember it takes patience and time for it to dry. Ellen from Card Monkey Jarvis has asked us to participate in a banner blog hop, but with this hop we are going to be sending our banners to the Pediatric Specialty Care Center for the children that are living there to enjoy so if you came from the talented Carol of Cardstock Scissors and Glue you are going in the right direction in the hope but if you just stopped by to see what I was up to please go the Card Monkey Jarvis to begin the hop. I hope you enjoy the banner that I made for my child to have placed over their bed. 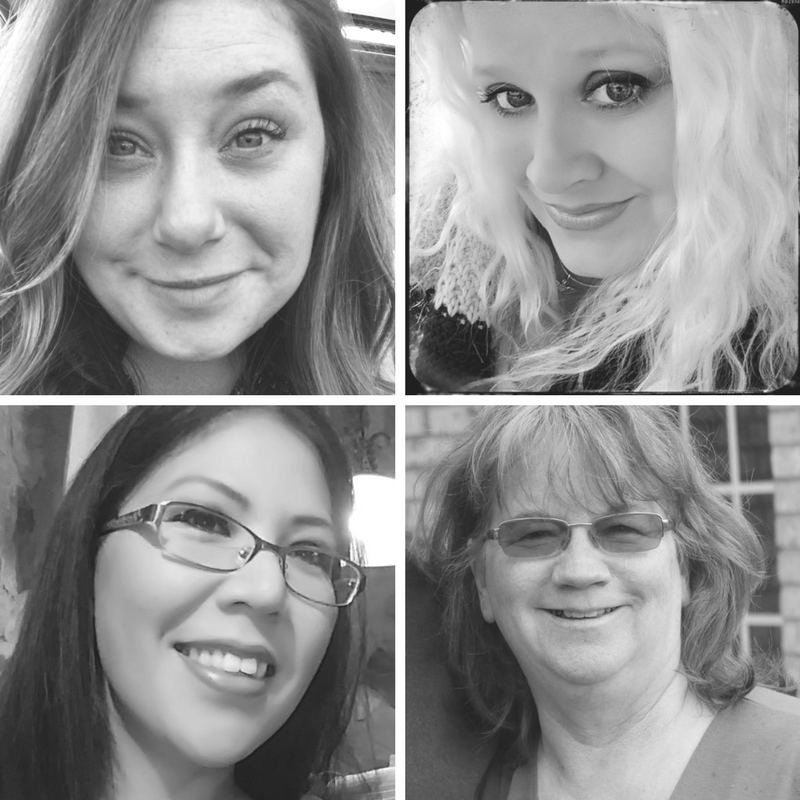 I thought I would share with you a tidbit that Ellen shared with the group; it is as following: I thought I'd tell you a little bit about the special kids we typically see at Pediatric Specialty Care (http://www.facebook.com/www.pediatricspecialty.com), so you know how much your banners will be appreciated. Many of the children who reside at PSC were born severely prematurely -- NICU babies whose lungs never had the chance to develop in-utero. While miracles of medicine have enabled some of the tiniest babies to survive and thrive with no developmental delays or physical problems, some require a lifetime of assistance to breathe, using a ventilator. Some other babies suffer the effects of having become drug-addicted or alcohol-dependent while their moms were pregnant. Others have had a traumatic birth, where they were "anoxic" or starved of oxygen, affecting their brains. Some have syndromes or diseases, like muscular dystrophy, sickle cell anemia, and cerebral palsy. There are some truly heartbreaking stories to be told of children at PSC who were healthy and "normal" until tragedy struck suddenly to change their lives and the lives of their families forever. 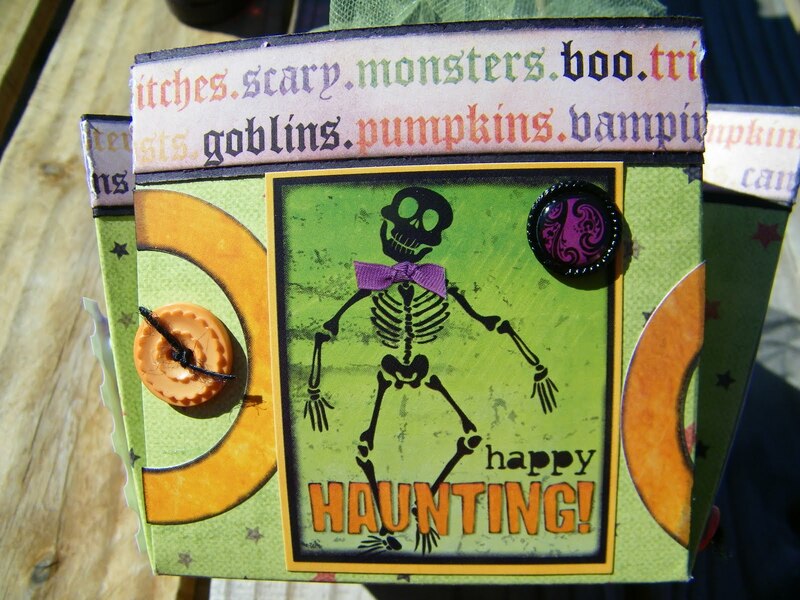 I made my banner primarily using the We R Memory Keepers Spookville Collection and a Bo Bunny set of 6x6 chipboard pages. We were asked not to be morbid or two scary and I felt this collection was more whisical. I haven't used stickers for awhile but I felt that the whimsy appeal of these worked perfectly for my banner. I had some die cut spider webs so I added them to this page along with a die cut that I had laying around. 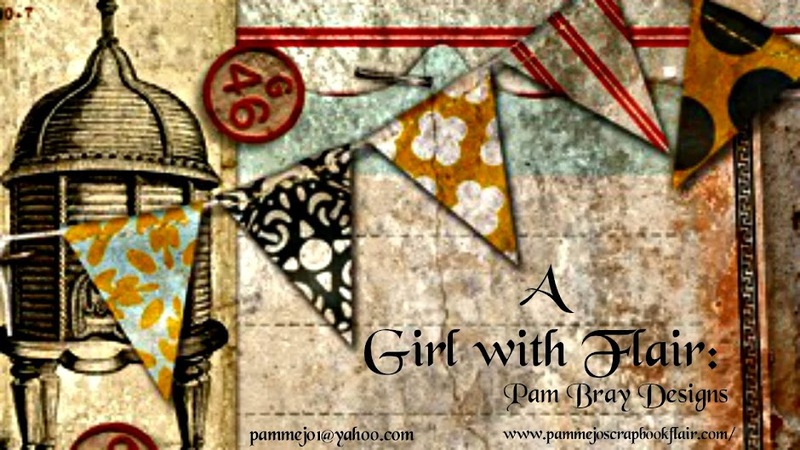 Here is a close up of my last banner page. I hope you enjoyed and let Ellen from Card Monkey Jarvis know how much you did. The next stop on the hop is with the very talented Gina of California's Scrappin'. 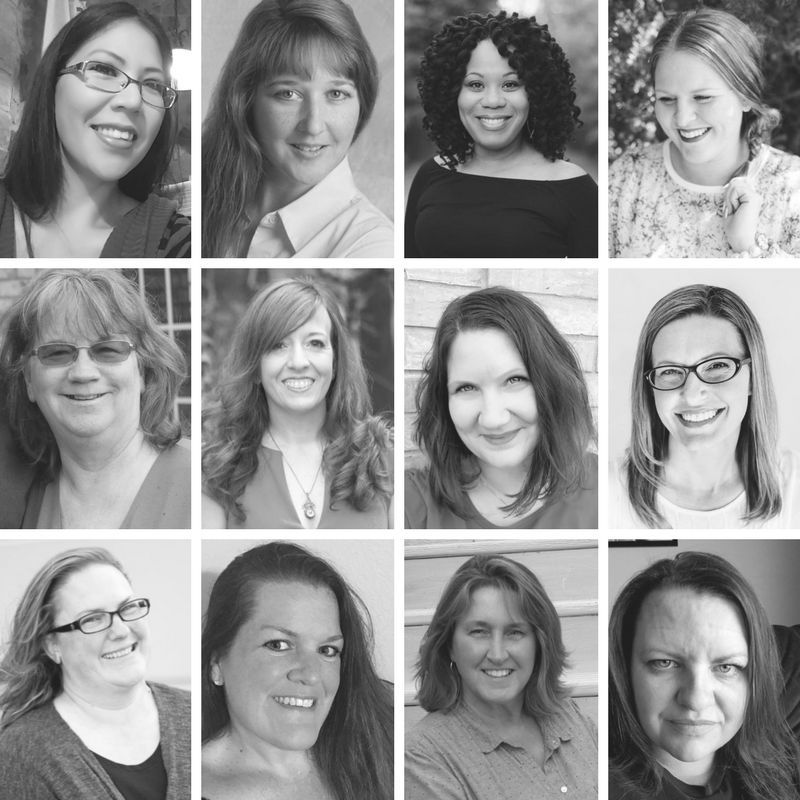 **Thank a sponsor/s for sponsoring our hop by clicking on the icons listed above and leaving a message on our sponsor/s blog saying "What a good GHOUL you are for sponsoring the Labor of Love Halloween Hop, happening today." 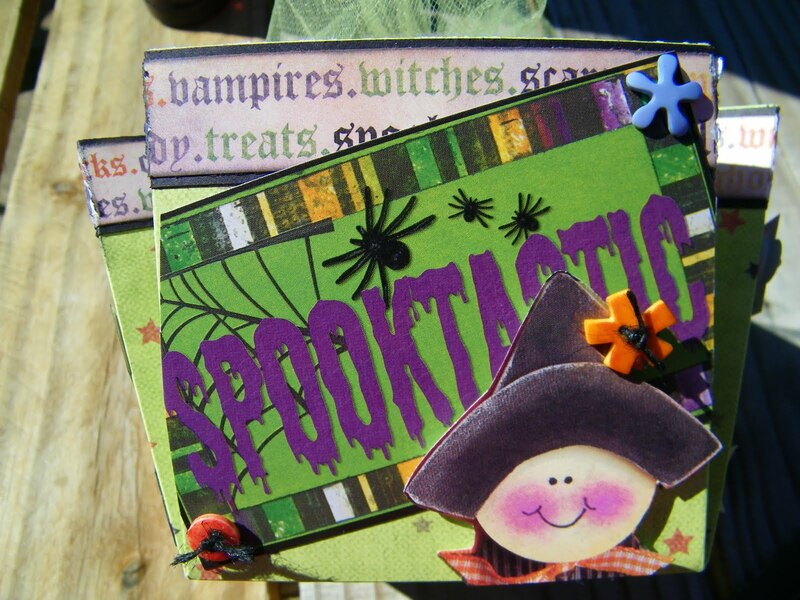 **Link a Halloween card to Funky Cards at the link provided at the end of the hop and donate it to the children at Pediatric Specialty Care. We will be using Random Organizer to match our prizes to our winners. You can enter all of the categories 1-4 and be eligible to win every prize:) There may be more than one winner in some categories and the more comments you leave the better your chances!! 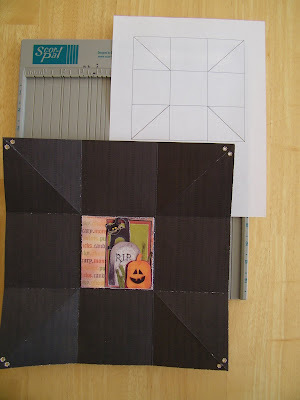 I was recently involve in a Birthday Card exchange that Anne from Paper Patch Crafts hosted. I would like to share the fabulous cards I recieved. It was a lot of fun doing the hop but I am so glad to recieve some amazing birthday cards for my own personal use. The first card was made by Debbie Flowers. The second card is by Elizabeth Collazo. The first card is by the talented Townsend and the second card is bythe very creative Shelley Toney of Heartstings Designs. 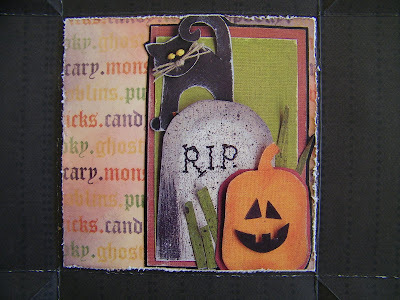 The first card is by Christine Hatchell of Scrapbooking Techniques. This card is by my friend and hostess Anne of Paper Patch Crafts. Again, just in case you missed yesterdays post, this is the my card that I made. If you would like to see the details of how it was made please see my post from yesterday. Thank you for the visit and please think about either hosting your own card exchange or getting involved with one that is going on. Well this is my birthday month so I thought I would start with a card that I made recently for a birthday card swap that I was involved with. I used the Unity Stamps August Kit for my cupcake image and colored it in with my Copic Markers: YG05,C1,R22,RV04,BV01,R27,R29,YR31,BO2,G14,R17 and BV04. 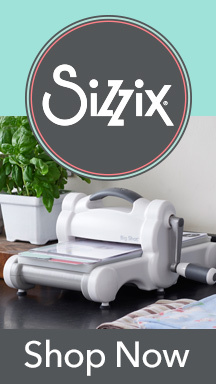 My paper is Doodlebug Nifty Notions and Petite Prints along with Bo Bunny Wassabi Dot. I used Kaisercraft Birthday Rub Ons for my sentiment. Here are my 10 cards that I sent out in the mail. Come back by tomorrow and I will share with you the ones I recieved, you will be pleasantly suprised and be filled with inspiration and ideas.